If you look carefully at the tapes of Watch Dogs’ delay announcement last night, you’ll notice another, less famous figure clinging to the open-world hacker’s waist as it pushed through the baying crowds. That was The Crew, an almost-as-exciting racing MMO led by some of the talent behind the Test Drive series, now pushed back to the middle of next year. Ubisoft’s fiscal babble suggests that The Crew is now expected to arrive between April and September 2014. The game was demoed at length throughout E3 this year, and no bits fell off while anybody was watching, so Ubi are presumably anticipating a monumental polish job rather than a major revamp. This is, after all, a game that seeks to encapsulate the best and most iconic driving experiences across the whole of the US – obviously shrunken to avoid unfavourable comparison to Desert Bus, but still a huge and varied persistent world which will reportedly take hours to speed across. Play in The Crew is generally cooperative in nature, taking in Brooklyn Bridge street races and SUV takedowns on Miami Beach. Players can hop around its facsimile of the States via a ‘satellite view’ at the push of a key. Development on the MMO has been led by French outfit Ivory Tower, formed from the ashes of Eden Games, alongside Driver veterans Reflections. The latter’s calendar in particular will take some serious reworking, as they’ve been heavily involved in the making of both this and Watch Dogs. 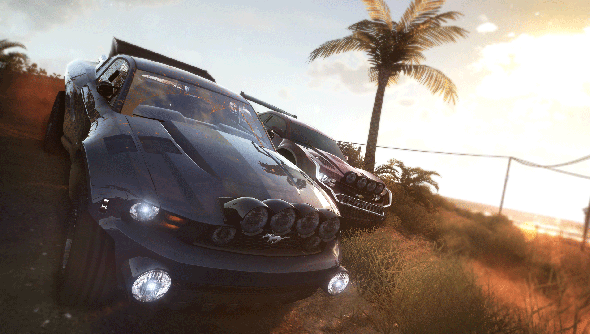 The Crew’s key competitor appears to be Need for Speed: Rivals, which takes the fictional US Redview County as its playground and incorporates “on-the-fly” multiplayer. Which has tickled more of your fancies thus far?